What do you do with designs that go nowhere? ... but then I ran out of time and it never got made and now I'm not sure what to do with it. Over the years I've worked on a LOT of sketches, doodles, prototypes and project ideas that never turned into anything. This is just part of the creative process! I usually squirrel them away for the future because you never know what might end up being useful as source material for another project, or what might end up working after all when you revisit it with fresh eyes in the future. This particular design, however, was so specific that I was convinced that it wouldn't possibly ever be remotely reusable. But I also really liked how it had turned out thus far and didn't want to just chuck it away (and have, as a result, wasted all that work). So, after finding the pattern in a pile of paperwork this weekend, I posted this pic on Instagram and Facebook and asked everyone: "what the heck could I or should I do with this??? 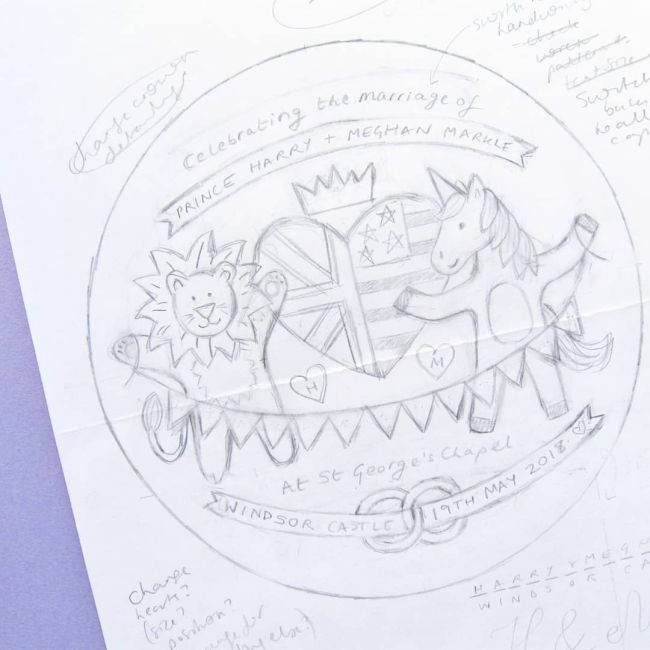 "Should I take the time to neaten it up a bit and share it on my blog in case there are some Harry & Meghan fans out there who'd like to (very belatedly) stitch themselves a wedding souvenir? Or just recycle it??" And, thank goodness for the magic of getting feedback via social media, because everyone immediately had such great ideas. Some people suggested sharing it to celebrate their upcoming anniversary, and lots of people suggested updating the pattern slightly so it could celebrate Meghan and Harry's baby, which is due this spring (I had totally forgotten that they're expecting a baby!). This could totally work for the royal baby! Other people suggested doing something just with the lion and unicorn on their own (maybe even adapting the whole design to be a customisable nursery sampler)... which I had somehow not thought of as a possibility??? I do love those little guys, though, they're just so cheerful and sweet and the unicorn took me absolutely ages to draw (because I am the world's worst person at drawing horses). I'm picturing the lion holding birthday balloons, maybe? Or the unicorn standing next to an awesome rainbow birthday cake? Something happy and fun and colourful, anyway. What do you guys think? I'd love to hear which of these suggestions you like, and if you have any more ideas for ways I could revisit this design and (finally) turn it into a finished project. And of course too many ideas and not all should materialise. for a good reason. For a real designer it is important to stay true to oneself and be completely sure you did your best, that you want this out, that years later you are likely to be content with it because it's a quality work.